Award-winning author MARY SHAFER writes mainly nonfiction, but the birthing process of her books involves many of the same challenges as those of a novel–and she does have a novel in the works. She splits her time between freelance writing, consulting with small and microbusinesses about their marketing needs and publishing books. The publishing company she founded is Word Forge Books. 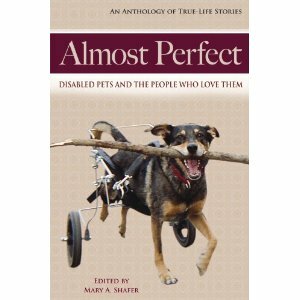 Her latest book is ALMOST PERFECT: Disabled Pets and the People Who Love Them. SANDRA CODY: What prompted your interest in writing? MARY SHAFER: I think for me it’s a matter of DNA. My whole family writes or at least did write at one time or another. My dad began his career as a newspaper reporter and later was a marketing copywriter. My mom was a very astute observer of life, and those observations manifested themselves in quite a few lovely poems. My brother and I were both on our high school newspaper staff, and he did sportswriting for our hometown newspaper for a while. And my sister is also a fulltime freelance writer, editor and published author. It probably also had to do with the fact that I was ill for long periods of time when I was young. Between the ages of about 7-12, I frequently was bedridden in the winter with pneumonia and other lung afflictions. When you spend that much time alone and not moving around, you had better develop some interests. For me, that was writing and drawing. Writing is really all about spending a lot of time looking at life and then ruminating about it in a more structured and restrained way than simply spewing. You also hope that your insights might help someone else struggling to figure it all out. I guess I’ve always been an introspective type, and–when I bother to think about it–my writing probably helps me sort out things I simply can’t understand. The truth is, I don’t often think about it. To me, that would be like thinking about why I breathe. It’s just something I do, and I must do it. SHAFER: Oh, undoubtedly, it’s the research. In one way, writing is like this license to run wild among the library stacks, spending an inordinate amount of time reading the most minute details about people I’ll never meet and places I may never go. It’s really a very decadent thing, very self-indulgent; but when attached to a book project, it seems somehow ennobled. Secondly–and this is what let me know I am truly a writer–I love to edit my work. When I struggled for 25 years to make my living as a graphic designer, there was nothing I hated more than having to re-visit something I’d already completed. But as a writer, I love going back to re-read; to examine each word to determine if it’s precisely the right one; to read aloud and listen to the cadence of the prose and play with it until it’s just right. While I simply love writing while I’m doing it, I have a love-hate relationship with thinking about doing it. I’ve been writing for as long as I can remember. The only thing I remember doing earlier in my life than writing is drawing. But I’ve always struggled with sitting down to actually do it. I’m not one of those who “wishes not to write, but to have written.” For the most part, I enjoy the process. But I have to make myself sit down and start writing. I do find that it’s more difficult since I switched (unwillingly) over to writing on the computer. I miss that sensuousness of writing with a really good pen on good paper. But the exigencies of deadlines force me to write the majority of my work on the computer. No one can deny that it’s much easier and faster, especially for someone like me who self-edits as she writes. I do, however, still do the first draft–at least the heavy outlines–of my fiction on a notebook. This question is the only facet of my writing that I ever have really thought about at length, and continue to do so because it vexes me. One time, I got very brutal and accused myself of being afraid that maybe I wasn’t “good enough.” I truly entertained that idea, but I made myself sit with it until I admitted that–as conceited as this may sound–I believe my work is just as good as, if not better than, most of the stuff I read on a daily basis. And to me, that’s “good enough.” So it must be something else. I don’t look at writing as some kind of sanctified process, but an honest bit of hard work. All I’ve come up with for why I have a hard time just sitting down to write is that I DO like it so much that–and this is especially true with fiction–it’s so hard to tear myself away once I’m at it. When I do finish a writing session, my fiction characters often won’t let go of me. They become almost more real than the people I actually know. They whisper to me and they haunt my dreams and I find myself thinking about them while I’m supposed to be doing whatever else. The closest thing I can equate to this is that peculiar obsession you get when you’re first falling in love; that scenario where, for some indefinite period of time, you simply can’t think about anything but the object of your desire and affection. I find anything that arrests my mind like this kind of scary, and not a little dangerous. So I fight it subconsciously, I think. There’s no secret to why I avoid writing nonfiction, though: it’s just damn hard work. Demanding and endless. CODY: Devastation on the Delaware has won high praise. Tell us something about that book and the research that went into it. SHAFER: Wow. Where to start? Well, to date, it’s the most involved project I’ve ever attempted and completed. The research and writing took me three years. I interviewed more than 100 survivors or family members of survivors of the 1955 flood. It was the first comprehensive historical treatment of this important weather disaster and we now have 5,000 copies in circulation. For a first-time publisher’s first book, I’m really proud of its performance. Of course, any time you write a historical event’s first treatment, you know you haven’t learned all there is to know about it. You know you couldn’t possibly talk to all the folks with something to add to the story, or all the people with facts to share. So you just do the best you can and hope you’ve gotten it mostly right. You know you’re opening yourself up to criticism. It’s no different for me. Since the book came out, I’ve had my share of people writing and calling to tell me something I got wrong. That’s okay – I not only expected it, I welcome the corrections. As a responsible historian, I’m interested in putting out the most accurate documentary possible. So, I’m currently in the process of revising the manuscript for the updated edition, which will come out in mid-August of this year. August 18, 2010 will be the 55th anniversary of the ’55 flood – in a sense, its Golden Anniversary. Ironically, when I finished the research in September 2004, the river experienced the first of three recent major floods when we were hit with the remnants of Hurricane Ivan. As an emergency management volunteer, I had to stop writing and go staff the operations center for three days. Then it happened again in April 2005, and in between my mother died. Despite all of this, the book finally did come out in October 2005 – a month after Hurricane Katrina ravaged the Gulf Coast. Hurricane-caused flooding was on everyone’s mind, and Devastation ended up being my own silver lining in our nation’s huge gray cloud. The book sold its entire first printing of 2,500 copies in 42 days and was back on press before Christmas. CODY: Tell us about ALMOST PERFECT: Disabled Pets and the People Who Love Them. SHAFER: This book was a labor of love, one I did purely because I got tired of, every time someone met my blind cat, Idgie, they would say something like, “Oh, Poor Idgie!” Idgie was born without eyes–she just had these little pink eye sockets. So she’s never been able to see anything. Consequently, she has no idea she’s missing anything. And so, in her mind, she’s not. Combine that with the fact that animals by nature are pragmatic – they just accept things for what they are and get on with life–Idgie lives a very full, rich life. She’s healthy, happy and doesn’t want or need anything. I wanted to write about that. And not JUST that, but also how–in rescuing her from a foster program for unwanted animals–we thought we were saving her, but she really ended up saving us. Well, me, at least. She gave me a lot of hope and inspiration after my mom died; a blow I wasn’t sure I could withstand. ALMOST PERFECT is a small book (128 pages). It’s an anthology of 11 stories like this, by authors in three countries. Apparently it struck a chord with readers, because even amidst this recession, we’ve sold 2/3 of the printing. I like to joke with people, saying that the book has legs, even if some of the critters inside don’t! CODY: How do you choose your subject matter? SHAFER: Unfortunately from a marketing point of view, I do it in a very undisciplined manner! I write about what interests me and, since I have a very wide variety of interests, that means it’s difficult for the publishing industry to niche me. That means it’s harder to promote me as an author, because I write about so many different things. As if promoting books isn’t hard enough! But I just accept it as part of my strong Gemini nature, and I’m happy not to be pigeon-holed. Of course, the marketer in me does keep an eye on how each subject is addressed. I do my homework about competing titles, angles, etc., to give my books the best chance of success. And I’m secure in the fact that no one can or will write a book exactly as I do. CODY: Tell us about Word Forge Books. SHAFER: Word Forge Books is the publishing division of my marketing business, The Word Forge. I’m an amateur blacksmith, and I like the analogy of pounding out meaning from words the way a blacksmith fashions something useful out of raw iron. That’s how I came up with the name. I started the publishing company in June of 2005 when the contract I had to publish Devastation with another publisher fell through because they went belly-up. Knowing there wasn’t enough time to place the book with another publisher that could get it done before the flood’s 50th anniversary, which was the promotional hook I needed to get it out there, I decided to publish it myself. I’d worked in the early 90s as an art director for a small press in Wisconsin, and I basically knew all the functions of publishing except distribution. So I registered Word Forge Books with Bowker, got my block of ISBN numbers, and just did it. Five years later, I won’t pretend I’m not struggling. But there are few publishers of any size who aren’t struggling in this strange new world of rapidly advancing technology. It’s something I really want to do, so I’m doing what I can to get back to profitability and make the company stronger for the long haul. CODY: What are some of your favorite books? 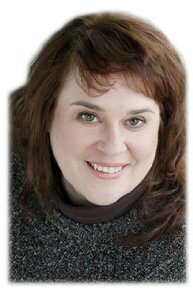 SHAFER: My absolute favorite of all time is Six of One by Rita Mae Brown. She’s by far my favorite author, and that particular book is not only (in my opinion) the finest of her Runnymede series, it’s also the one I return to time and again when the world threatens to make my head spin. I love most of her other work as well. In fiction, I also like some of Kaye Gibbons’ work. She’s a very stylized writer who nevertheless gets right to the heart of a story. Otherwise, I mainly read nonfiction. Glancing at my bookshelves, it’s immediately apparent I’m a severe weather/disaster story junkie. My favorites in that genre include: Eric Larsen’s Isaac’s Storm, Sebastian Junger’s The Perfect Storm and David Laskin’s The Children’s Blizzard. I also highly recommend R. A. Scott’s Sudden Sea and Close to Shore by Michael Capuzzo. I’m also a huge reader of well-written biographies. CODY: What, besides writing, are you interested in? SHAFER: Too much! That’s my problem: too many interests and not enough hours in a life! My main interests include drawing, oil painting, teaching, metal detecting, blacksmithing, wordworking/refinishing and exploring the connection between honoring the creative urge and maintenance of physical, emotional and mental wellbeing. CODY: Anything else you’d like to tell us about yourself?